Watch again the HGTV series, “Flea Market Finds with the Kovels,” the TV show that will make you an expert on almost anything you see at a flea market. Get 4 bonus episodes from Season 1-4 for only $9.95! 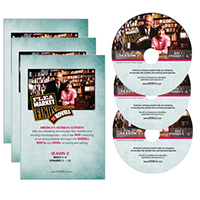 “Flea Market Finds with the Kovels” was created by Emmy Award-winners Albert Fisher and George Merlis, and was produced by Jeff Copeland for Los Angeles-based Flea Market Productions.